To donate to the Mary Nutter Memorial Fund, click the link below. Sept, 2016 – This summer, we were able to award two $1,000 scholarships to young women competing in the 2016 NSC Recruiting Tournament. Mary began this tournament several years ago with the goal of bringing together college coaches and athletes who seek to play softball in college in a way that aided the recruiting process. This was the fourth year we awarded the Mary Nutter Memorial Scholarship, allowing us to help 9 young women to date with their college education. If you would like to help us continue this effort to provided educational scholarships in Mary’s name, this link will assist you. Also, in 2016, the Manton Alumni Association awarded a $2,000 scholarship in Mary’s memory to a Manton High School graduate. Thanks to many of you, this scholarship will be awarded annually on a permanent basis. Mary would be so proud and happy to be helping students from her beloved Manton High School! The Manton Alumni Association has done a remarkable job for years in supporting students and they were wonderful to work with on Mary’s scholarship. The National Fastpitch Coaches Association recently announced the 2016 recipients of the Mary Nutter Scholarships. One of the recipients happens to be from Kansas and knew Mary through our clinics and tournament, so that was exciting! These scholarships assist coaches who wish to attend the association’s national convention with travel, accommodations and convention registration fees. Again, Mary would be very pleased with this effort. 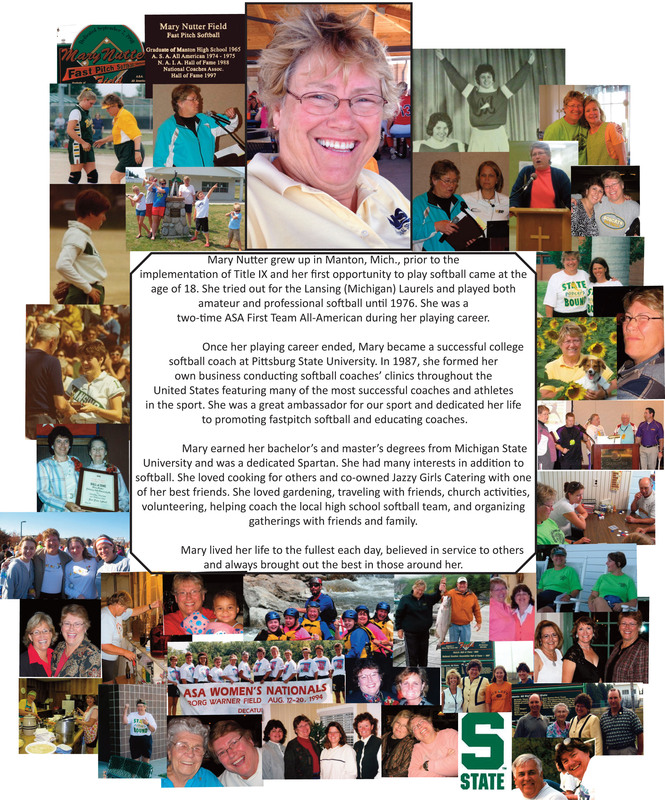 Most of us can’t imagine a time when we won’t miss Mary at our gatherings, ballgames, clinics, vacations or miss her emails or phone calls. The imprint she left on our lives was real and it was good. What an awesome legacy – to have impacted, in a positive way, so many people. God truly worked in and through Mary to make our world a better place. May God bless all of you for what you have done and continue to do to keep her memory alive and to help introduce her to young people who didn’t get the chance to meet her in person.